I've got to thank the One Minute Mason again for the idea. If you haven't checked out Steve Harris' blog, click on the link. It's a great collection of short pieces that make you stop, scratch your head, and say "Huh, I didn't know that." Dan Beard was a very interesting man, and he's been on the periphery of my research for years--his name has come up again and again, in fact, he's on the list for inclusion in the last volume of the Famous American Freemasons series. He's best known for organizing the Boy Scouts of America. Known to the scouts as "Uncle Dan," he also wrote a very popular monthly column in Boys Life Magazine for many years. 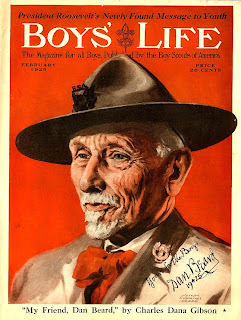 But long before he was involved with scouting, he was a noted author and illustrator--not to mention he had a lot of very interesting friends. He knew men like publisher James Gordon Bennet, Wild Bill Hickok, Buffalo Bill Cody, and Billy the Kid. But his friendship with Mark Twain was one he is most remembered for. It wasn't long before Twain called upon his friend's talents and asked him to illustrate his book A Connecticut Yankee in King Arthur's Court. Dan Beard went to work on the illustrations immediately, and did more than 200 for the book over the period of a single week--and Twain's book, along with Beard's illustrations, has never been out of print. Uncle Dan Beard was a member of Mariners Lodge 67 in New York City and later, he joined Cornucopia Lodge 563, Flushing, New York.